As the "Crossover Day" deadline looms large this coming week, for the West Virginia Legislature to pass legislative proposals (bills) out of the originating chambers (House of Delegates and Senate), it seemed prudent for me to pause and ponder anew this reminder from Valley Forge that helped persuade me to serve as a citizen legislator. The spirit of a lone soldier in George Washington's Continental Army stands barefoot in the freezing snow. Shivering in rags, hungry, and blood-stained from battle; he holds his battered musket in bandaged hands. There's fire in his eyes. "I gave to you a birthright of freedom, now enshrined in your Constitution, but your children graduate from high school too careless to read it. I fought in the icy winter, without shoes and with bloody feet, to give you the right to vote, but you stayed home on election day. I left my family destitute and hungry, so you could have the freedom to stand up and speak out for liberty, but you remain uninvolved. I orphaned my children, to give you a government endowed by God, but you have sat back and allowed others to hijack our rights and responsibilities." And so, while the West Virginia Legislature remains in session, it nevertheless continues to remain up to each and every one of us, me and you together, to work to preserve our precious heritage of freedom, for which so many others have sacrificed so much. Footnote: Please also take a moment to click on the "Why It Matters" as well as the other links listed under "Videos" on the right hand side of this website. Participating in this morning's State House meeting of the Eastern Panhandle Legislators were Senator Don Cookman as well as Delegates Larry D. Kump, Mike Folk, Larry Faircloth, Steven Skinner, Paul Espinosa, Ruth Rowan, Daryl Cowles, Eric Householder, and John Overington. The Maryland Area Regional Commuter (MARC) train legislation (SB 103, HB 2879) was reported on by the Reverend J. Charles Riecks, National Association of Railroad Passengers spokesperson. He reported that MARC has been serving the Eastern Panhandle of West Virginia since 1983, but West Virginia never has had a voice in its operation. SB 103 and HB 2879 would allow West Virginia to enter into an Interstate Compact agreement with Maryland and give West Virginia a voice on behalf of the Mountaineer commuters who use MARC to travel to and from their jobs. Approximately 450-500 West Virginia commuters board the MARC trains in West Virginia (not counting the additional West Virginians who board the MARC train in Brunswick, Maryland to catch the much earlier MARC train to Washington, D. C.). Mr. Riecks suggested that, with MARC service to West Virginia, West Virginia would have to create additional road and bridge capacity for the increased automobile traffic. Both SB 103 and HB 2879 are pending consideration by the Finance committees in the House of Delegates and the Senate. A representative of the West Virginia Department of Transportation and also Attorney General Patrick Morrisey will be invited to upcoming meetings of the Eastern Panhandle Legislative Caucus. Beginning next Monday, the Eastern Panhandle Legislative Caucus meetings at the State House will begin at 8:30 AM. Meanwhile, click on "A Budget Solution for You & Me" under the "Video" links on the right hand side of this webpage. West Virginia would change how county school districts hire teachers, free up more days on their calendars to bolster student instruction and require full-week schooling for 4-year-olds statewide, under legislation sent to Gov. Earl Ray Tomblin on Friday. Note: Visit the "2013 Legislative News #7" entry below for more of this about that. The passage of and signing of SB 359 into law will not remedy West Virginia's education crisis. Left unresolved and still a problem is the lack of direct accountability of the West Virginia State Board of Education to Mountaineer voters and the continuing problem of too much top heavy bureaucratic authority over local schools. The needs of students and the voices of parents will be much better served if we provide much more voter ownership of our educational system by making the members of the West Virginia State Board of Election accountable to voters in non-partisan General elections (HJR 35 - Constitutional Revision Committee), and moving the non-partisan local county school board elections from the Primary to General election (HB 2555 - Education Committee). Further, SB 359 weakens the employment qualifications of the State Superintendent of Education, and removes the cap on his salary, even though he already earns more than the West Virginia Governor. Until 1932, the State Superintendent of Education was an elected official, but now is appointed by the State Board of Education (who also aren't elected, but appointed by the Governor, and who has no authority over them after their appointments). The State Superintendent of Education also is the only unelected state official who serves on the State Board of Public Works (Serving on the West Virginia Board of Public Works are the Governor, Secretary of State, Auditor, Treasurer, Attorney General, Commissioner of Agriculture, and the State Superintendent of Education). Sadly, SB 359 is full of sound and fury, signifying not so much (apologies to Shakespeare's "Macbeth"). The deadline for introducing new legislative proposals (bills) is only a few days away. Further, committee voting on bills introduced must be completed in the originating chamber by the end of this month. Each chamber (House of Delegates and Senate) must complete voting on bills in the originating chamber by April 3rd. Then, each chamber will turn their attention soley to discussing and voting on bills that already have been passed in the opposite chamber. At the last minute, this morning's State House meeting of the Eastern Panhandle legislators was unexpectedly aborted, due to the preemption of our meeting room by another group. Since there were no other meeting rooms available for us this morning, the meeting will be rescheduled, at a date and time yet to be determined. The Reverend J. Charles Riecks, National Association of Railroad Passengers, was to be the guest speaker for this meeting. He had intended to answer questions about SB 103 and HB 2879, in regard to the proposed participation by West Virginia in the Maryland Area Regional Commuter (MARC) train system, which currently serves the Eastern Panhandle of West Virginia. SB 103 and HB 2879 are the legislative bills that address this issue. Both bills have been passed by the Transportation Committees in the House of Delegates and State Senate. Both bills currently are awaiting further committee hearings before the House of Delegates and State Senate Finance Committees. Visit the other entries at this website for more legislative news. The intemperate statements, allegedly directed against the personal safety of West Virginia State Senator Herb Snyder (D-Jefferson County), are both alarming and churlishly counterproductive to good governance and civil discourse. Of course, the 2nd Amendment to our United State Constitution resonates deeply within the hearts and sinews of Mountaineers. We are understandably and deeply passionate about our right to keep and bear arms. However, as the West Virginia State Senate prepares to further deliberate and decide how to best protect our God given and Constitutional rights and responsibilities, we all need to keep our focus solely upon the important principles and issues now being considered by the West Virginia State Legislature. Even so, let us not also be led astray into believing the inflamed outbursts of a feckless few represent the mind of the many, who anxiously are striving to preserve our sacred liberties. To do so would be akin to painting all of Christendom with the brush strokes of those such as David Koresh and the Reverend Jim Jones. Your suggestion, that we amend the West Virginia Constitution to make the West Virginia State Board of Education directly accountable to voters via non-partisan elections, scythes through the chaff from the often bloviated and byzantine blathering of numerous nattering nabobs (with a vengeance). Count me in as an enthusiastic supporter of this proposal, preferably to be implemented in General elections, as I similarly have proposed for local county school board elections (HB 2555, House of Delegates Political Subdivisions Committee). Let's give Mountaineer voters a direct say in our children's education. CHARLESTON — Currently in West Virginia, the names and addresses of concealed weapons licensees is public information. Any early release, including parole, of any person convicted of child abuse (or abuse of a vulnerable person) seriously endangers public safety. Those committing these heinous crimes should never be eligible for accelerated release or parole, inasmuch as their danger to public safety is ongoing. These felons, while not a large percentage of prison populations and usually not a behavioral problem while incarcerated, nonetheless constitute a clear and present danger to the public upon their release from incarceration. Allowing parole officers to carry concealed deadly weapons simply is prudent policy. Care should be taken to not create a burdensome bureaucracy with this process. Many jurisdictions have become so enamored with complex assessments that the assessments actually have become counter-productive to positive outcomes. There is a real danger that administration of these assessments will consume too much of the time that criminal justice employees should be spending in more productive ways. Suggest streamlining this criteria by simply mandating that it should be "cost and time effective" and that reports about programs be "outcome based", to help forestall the temptation of agencies to simply tout the number of programs and participants as indicators of success. I would suggest that a prison case manager (non-supervisor) also serve on this subcommittee, inasmuch as it is this line position that has a tremendous insight into effective programming and need. The definition of a member "with a background in substance abuse treatment and services" should be further clarified to emphasize the principle that preference shall be given to the appointment of an individual with successful direct experience with abusers in abuse service and treatment and without regard to formal education. It has been my sad experience that abuse treatment can become a "cottage industry" for degreed professionals, while the most effective abuse counselors are those who have had personal and real world experience in overcoming addictions. In prison environments, often the most effective mentors are those who can relate to the abusers by showing them how they overcame their own abuse addictions (including fellow inmates). The Twelve-step Alcoholics Anonymous and Narcotics Anonymous are two good program examples. Also, inmates often use addictions programs merely as tools to "game the system" and to glean certificates of completion for parole and release purposes, but without merit. The focus of violations of probation on absconding from supervision or committing a new crime, instead of other minor issues perhaps is the most excellent recommendation to reduce bureaucracy and counter-productive criminal "justice" in SB 371. However, I would suggest that the penalties for minor probation violations be even more lenient and less structured. These provisions are most welcome. A major problem with release from incarceration is lack of the ability of inmates to find a home plan or to become employed and productive members of society. Giving parole officers the right to imprison, without approval of the court, really worries me. Drug courts have been an effective tool, tremendously reducing recidivism (as well as prison costs), and should be supported and expanded. Finally, much more should be attempted to address West Virginia's prison problems, in addition to the above suggestions regarding SB 371. Participating in this morning's State House meeting of the West Virginia Eastern Panhandle legislators were Delegates Larry D. Kump, Larry Faircloth, Mike Folk, Ruth Rowan, Paul Espinosa, Eric Householder, Daryl Cowles, and John Overington as well as Senators Don Cookman and Craig Blair. Berkeley County Councilperson Jim Whitaker also participated in the meeting. West Virginia Supreme Court Chief Justice Brent Benjamin made a presentation on both adult and juvenile West Virginia drug courts, and an intense discussion with the legislators and Councilperson Whitaker followed. Also and previous to and after the meeting, Delegate Kump and Senator Cook had a personal discussion about SB 371 and other criminal justice issues. Next week, the caucus hopes to schedule a presentation and discussion regarding the pending Maryland Area Regional Commuter (MARC)legislation on behalf of MARC commuters from West Virginia. Please visit the "Journal Legislative News #3" and other entries at this website for additional legislative news and views. 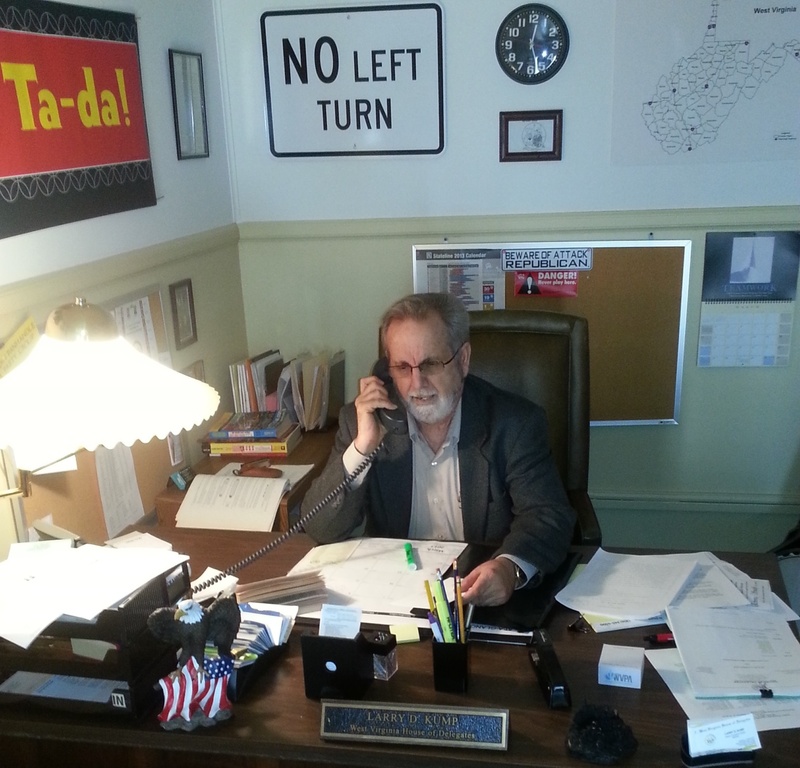 West Virginia Delegate Larry D. Kump, District #59 (Berkeley-Morgan Counties) has been carefully watching the proposed legislation on education as it is debated in the West Virginia State Senate. After the Senate works its will on this legislation, the Falling Waters Delegate will carefully scrutinize the amended version when it comes up for a vote in the House of Delegates. However, he laments that the Governor's proposed legislation on education reform falls short of doing enough to reduce State Board of Education bureaucracy and empower local school boards, as well as the teachers' ability to be effective in their classrooms. He also believes that further citizen participation and "ownership" of education, through increased voter participation, would be much improved by moving county Board of Education elections from the Primary to General elections (HB 2555). On the issue of bar closing times in the Eastern Panhandle and the problems they create by encouraging over indulgent boozers from Maryland and Virginia to bring their rowdy and dangerous behavior to West Virginia, Kump believes that the most effective and straightforward solution would be to empower individual West Virginia counties to set their own rules and regulations regarding alcohol consumption, as is done in other States. He will be introducing legislation to do just that, as well as making these rules and regulations subject to voter referendums. HCR 51 & HCR 61 Our State & Citizen Rights (Rules Committee) Requests the Joint Committee on Government and Finance to establish a post session Interim Study on the impact of federal laws and regulations upon the sovereign rights of the State of West Virginia and our citizens, as protected by the Tenth Amendment to the United States Constitution. HB 2594 Teaching Our American Heritage (Education) Would require schools to teach about the Declaration of Independence, our Constitution and Bill of Rights, and other relevant historical documents and events from the era of our Founding Fathers. HB 2828 Protecting Vulnerable Children (Judiciary) Would make it a crime to solicit a child to enter a vehicle in order to commit an offense against that child. HB 2871 Drivers' License Reform (Judiciary) Would remove the mandatory requirement for Mountaineer citizens to submit to the arcane and stifling regulations that make it so difficult to obtain new and renewed West Virginia driving licenses. This measure was passed in previous legislative session by the West Virginia Senate, but never approved by the House of Delegates. HB 2882 Budget Reform (Finance) Would reduce West Virginia budget expenditures by one percent (1%) each year for ten (10) successive years. HB 2884 Freedom of Information Act (FOIA) Reform (Judiciary) Would reform the West Virginia Freedom of Information Act (FOIA) to remove loopholes and make it easier for West Virginia citizens to ask for and obtain information and accountability regarding what our West Virginia government agencies are doing. All bills first must be heard and voted upon in their assigned legislative committee before receiving further legislative consideration (Committee assignments are listed after each bill number and title above). More information on legislative issues and other legislation sponsored and cosponsored by Delegate Kump is available at other entries at this website. For information on bills not listed at this website and which legislators are assigned to which committee (and how to contact them), click on the "WV State Legislature" link under "Links" on the right hand side of this webpage. Attending this morning's State House meeting of the Eastern Panhandle legislators were Senator Don Cookman as well as Delegates Larry D. Kump, Mike Folk, Larry Faircloth, Daryl Cowles, Paul Espinosa, Eric Householder, John Overington, and Ruth Rowan. Guest participants were Scott Swaim and Kurt Fuchts from West Virginia Farm Credit. There was a spirited discussion about education reform. Delegate Kump lamented that the proposed legislation from the Governor does not sufficiently reduce the bureaucracy and control of the State Board of Education and suggested that the proposed legislation needs to do more to empower local county boards and local teachers. The consideration of adult drug courts for the Eastern Panhandle was broached. Delegate Eric Householder will follow up and do additional research. There was discussion of HB 2720 (bar closing times). Delegate Kump suggested that the best solution to this issue would be to give the authority to individual counties to regulate alcoholic beverages and that proposed county regulations should then be subject to a voter referendum in the following general election. The Workers' Compensation coverage cost problem for volunteers at local fire departments was discussed. HB 2723 by Delegate Larry Faircloth would institute a five percent (5%) surcharge on bail bonds (to be paid by those getting the bail bonds) to help fund regional jails and state police operations. Additional legislative news is reported in other entries at this website. For even further information on other bills introduced and the legislators who are assigned to the committees with responsibilities for these bills, click on the "WV State Legislature" link under "Links" on the right hand side of this webpage. Delegate Larry D. Kump, District #59 (Berkeley-Morgan Counties) will be pushing for legislation to reform the West Virginia Freedom of Information Act (FOIA). Current law on the issue has so many loopholes that citizens routinely are rebuffed and denied, when they ask for accountability and information on what our state government is doing. Kump is a persistent and fervent advocate on behalf of government and legislative transparency as well as citizen accessibility and participation in both. The Falling Waters Delegate's recent letter to the Beretta firearms company national headquarters in Maryland, suggesting to them that they relocate from that anti-personal liberty state to the much friendlier Eastern Panhandle of West Virginia, has caught the attention of the Maryland State Legislature. Maryland State Senator Christopher Shank (R-Washington County) has asked West Virginia Delegate Kump for permission to read his letter aloud during a session of the Maryland State Senate. HCR 51 Our Citizen & State Rights (Rules Committee) Requests the Joint Committee on Government and Finance to establish a post session Interim Study on the impact of federal laws and regulations upon the sovereign rights of the State of West Virginia and our citizens, as provided by the Tenth Amendment to the United States Constitution. HB 2728 Parking for Disabled Veterans (Veterans' Affairs and Homeland Security) Would allow any veteran with a disabled veteran automobile license plate to park in handicap parking spaces. The above are only some of the proposals that he has and will yet introduce in the West Virginia Legislature (see other entries at this website). All bills first must be heard and voted upon in their assigned legislative committee before receiving further legislative consideration. (Committee assignments are listed after each bill number and title above). For information on other bills introduced and which legislators are assigned to which committee, click on the "WV State Legislature" link under "Links" on the right hand side of this website.